String up your guitar or bass in no time. The Ernie Ball PowerPeg winds your guitar or bass strings up to 70% faster than conventional manual winders. The easily portable Powerpeg string winder is perfect for home, stage, the jam room, or anywhere you need a complete string change. 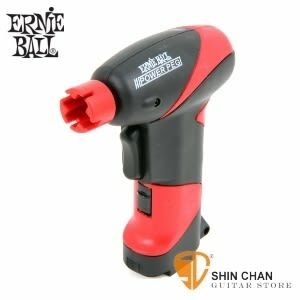 The compact battery-powered Ernie Ball PowerPeg winder is one of the most useful accessories for guitarists and bassists. The PowerPeg string winder's universal head attachment fits all tuning peg head types including bass, acoustic and electric guitar and other stringed instruments. A custom locking on-off trigger prevents accidental or unintentional operation.